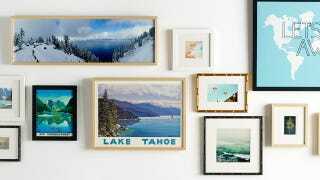 Make the boring walls of your home beautiful with your favorite pieces of art and photography, and do it hassle-free. Framebridge's simplified at-home process allows you to place an order in five minutes and at a significantly lower cost than traditional stores. Finally get those dusty works of art custom framed and take 15% off with promo code Gawker15. Whether you're giving a thoughtful gift or finally putting respectable art on your walls, now quality framing is easy for a fraction of the cost. Use promo code Gawker15 at checkout.